The Santa Fe Conservation Trust, the City of Santa Fe and Santa Fe County work with the Trails Alliance of Santa Fe, Santa Fe National Forest, Santa Fe Fat Tire Society, and other public and private partners to develop, maintain and promote our local trails. The Santa Fe Conservation Trust has been involved in the creation of the Dale Ball Trails, Atalaya Trail, Sun Mountain Trail, Santa Fe Rail Trail, the Spur Trail, La Tierra Trails, Arroyo Hondo Open Space Trails, La Piedra Trail, Little Tesuque Trail, and–with the Commonweal conservancy–the Galisteo Basin Preserve Trails. 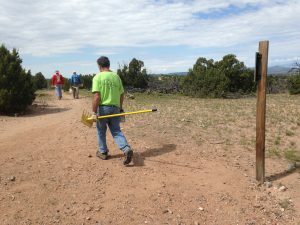 The Santa Fe Conservation Trust currently serves as “Trail Volunteer Coordinator” for the City of Santa Fe, has adopted SFNF’s Atalaya Trail, works with various “GUSTO” partners to plan and promote trail connections throughout the region, and preserves public trail access within many of our local conservation easements. GUSTO: The Grand Unified Santa Fe Trail Organization or “GUSTO” initiative is an effort to study and develop an integrated and unified trail system in and around the Santa Fe area. GUSTO’s vision is a “grand unified trail system” that allows non-motorized users to travel in a loop around the greater Santa Fe area as well as between the urban center and the periphery. The GUSTO initiative will lead community participation efforts to have a unified, sustainable trails system built around the entire metropolitan area by 2020. Read Margaret Alexander’s Neighborhoods and Trails: Resolving Issues to learn how trails benefit your neighborhood. SFCT hosted the 2012 Southwest Trails Conference. Presenters’ information for this event can be found HERE.